Opening reception: Tuesday, January 26, 6:00-8:00 p.m.
Part exhibition, part archive, and part platform for workshops, events and talks, Mass Observation 2.0 aims to create a participatory space for research and exchange. It is based on a collaborative transdisciplinary seminar and project by Parsons/The New School's School of Art, Media and Technology, New York and the Institute for Art and Art Theory / Intermedia, University of Cologne. 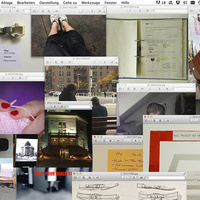 The project aims to research everyday life with a theoretical and practical, analytical and investigative, critical and experimental, online and offline approach, and to understand the everyday as a phenomenon that since modernity continuously shapes our perception of the world and increasingly generates altered forms of communication and relatedness under the influence of new technologies. The exhibition features digital material in the form of a collective “dominant image” archive, creating and performing instructions devised by students as methods for defamiliarizing and interrupting habitual responses to the everyday, as well as artistic research projects. Based on the studies of the historical social research organization Mass Observation, founded in 1937, which was conducted by British anthropologists, artists, social scientists and psychologists to respond to the fact that the everyday life of “common people” was not represented in the media nor in the political system of Great Britain at this time, the goal of this project is to question how everyday life is perceived today, in a globalized world, where the requirements of social media to perform oneself seem ubiquitous, and the demands of technology affects our sensibilities on an everyday level. Investigative themes featured in the exhibition include: the changing construction and definition of “private” and “public”; “friends” and “strangers”; the ways in which the digital and built environment situates us as subjects; how these environments invisibly promote a passive or active engagement in everyday situations as well as the way recent shifts in technology have affected our relationship to everyday physical objects and materials. This exhibition and the accompanying program was made possible with the generous support of Parsons/The New School's School of Art, Media and Technology-based Funds, and the University of Cologne, Fund for Innovation in Teaching. A work of art does not already exist in its material qualities or even in meanings somehow inscribed in the exhibited objects by the artist, but only unfolds through and in the experience made by the beholder in relation to the objects. Neither the artist nor the objects themselves “fathom / debate / examine / reveal / reflect / question / etc. something,” as can be frequently read for example in press releases. The practice-based workshop aims to show how both artistic selection of an object and its spatial-situative placing concretely affects its experience. Each participant in the workshop is kindly asked to bring a carefully selected everyday object that can be found or bought in the streets without entering a building. Try to choose a thing that means nothing, that carries no context. In the workshop we will discuss the selection of the objects before arranging and displaying them behind the large storefront/glass window inside the Aronson Gallery—particularly in regard to how this display will influence the way we experience them. Jan Timme, born in 1971 in Stuttgart, Germany, studied at Hochschule für bildende Künste Hamburg from 1994 to 2001 under Michael Lingner, Wolfgang Tillmans, Cerith Wyn Evans and Cosima von Bonin. Exhibitions include Rotten Apple at Galerie Nagel Draxler, Berlin 2015, Ready to Sleep (Arbeitstitel) at Galerie Mezzanin, Vienna 2014 (group show), The Gospel According To … at The Holden Gallery, Manchester 2012 (group show), Hello There at Durstewitz Sapre, Hamburg 2007, Luft – air at Marc Foxx Gallery, Los Angeles 2005, One for sorrow two for joy at Kunstverein Braunschweig, and Bald fliegt der ganze Schwindel auf at Kunstverein in Hamburg, both in 2003. Jan Timme lives and works in Berlin. Norman Klein is a professor at the California Institute of the Arts and a critic, urban and media historian, as well as novelist.His books include: The History of Forgetting: Los Angeles and the Erasure of Memory; Seven Minutes: The Life and Death of the American Animated Cartoon; The Vatican to Vegas: The History of Special Effects; Freud in Coney Island and Other Tales; and the database novel Bleeding Through: Layers of Los Angeles, 1920-86. His essays have appeared in anthologies, museum catalogs, newspapers, scholarly journals, and on the web. They are symptoms of a polymath’s career, ranging from European cultural history to animation and architectural studies, from special effects to cinema and digital theory, to LA studies, fiction, media design and documentary film. His work (including museum shows) has centered on the relationship between collective memory and power in urban spaces; the thin line between fact and fiction; and erasure, forgetting, scripted spaces, and the social imaginary. Since David Hume’s 1757 essay, “ Of the Standard of Taste”, our enlightened understanding of art and aesthetics has become increasingly socially nuanced. No longer rational or objective, the qualities of one’s taste are appreciated as entirely an “effect of the mind”. Nevertheless, we’re suckers for the kitchen table science of a taste test. This informal, public experiment in the Aronson Gallery will compare, contrast and “name” the tastes of various products using common language in order to aesthetically describe our blind experience of taste. The City of Others is a walking workshop that investigates locations around New York City. On our commute from home to work, we pass many places that hold other people’s stories. This workshop will allow participants to explore the city through a stranger’s story. Yihan Zhou is an MFA in Design and Technology in the School of Art, Media and Technology, Parsons.